Also in the group are Anguilla and host Antigua and Barbuda. 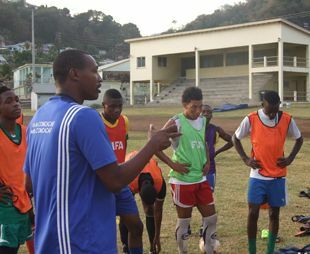 And, head coach of the St Vincent and the Grenadines outfit Cornelius Huggins is taking it one game at a time. âBut we are looking to get something out of our first gameâ¦ We have to try to pick up a point or a win, otherwise we would have to be playing catch up,â Huggins told SEARCHLIGHT last Sunday. However, Huggins said that he was still hoping to have an international friendly to assess his playersâ match readiness. Huggins confirmed this, although the team had some friendly matches versus local club teams during their run up to the competition. The last test for the team was in their outing in Dominica at the Windward Islands tournament, in which St Vincent and the Grenadines placed second behind St Lucia. Huggins, who carried to the second round of the 2012 Caribbean Championships, indicated that his charges are well gelled as it is basically the same team which went to the Windwards tournament. The 18-member team, which left here on Monday includes Kenyon Lynch, Dwaine Sandy, Azhino Solomon, Danroy Edwards, Darren Hamlett, Emerald George, Javid Sutherland, Jarrel Mc Master, Kevin Francis, Kyle Edwards, Nazir Mc Burnette, Oalex Anderson, Ronsil Badnock, Roy Richards, Tevin Slater, Vasbert Ledger, Shorn Lowman, with Myron Samuel expected to join the others from New York. Samuel was part of the St Vincent and the Grenadines outfit which contested last Sundayâs final of the New York Caribbean Cup, but lost to Jamaica two-nil. Apart from Huggins, the rest of the management team is assistant coach – Wesley Charles; goal keeper coach – Kevin Richardson; kit manager – Alnif Williams and physiotherapist – Denis Byam. The team manager is Othneil Delpesche. Committee member – Dominique Stowe is also part of the contingent. St Vincent and the Grenadines faces Anguilla also from 5 p.m. on Friday. The Vincentiansâ last match is against host Antigua and Barbuda from 7 p.m. on Sunday. The winner and runner-up of the group head to the semi-finals. The winner will be stashed in group seven, alongside Trinidad and Tobago, the runner-up of group and the best third place. Meanwhile, the runner-up of group five will be placed in group nine with host Guadeloupe, as well as winners of groups three and four. Haiti, the runners up from groups three and four, and group six winner, make up group eight of the semi-finals. The three group winners and their runners-up advance to the finals, to meet automatic finalists – host Jamaica and defending champion – Cuba.